This Flagship Program focuses on food systems through the agri-food value chains impact pathway and the associated policy enabling required to accelerate food system innovation, scaling, and anchoring. A food system is the full set of processes, activities, infrastructure, and environment that encompass production, processing, distribution, waste disposal, and food consumption. Food systems are multidimensional, including sociocultural, economic, environmental, and political aspects, and complex, with multiple actors (food producers, food-chain actors, and consumers) managing multiple linked and nested agri-food value chains within dynamic and interactive food environments. This flagship responds to concerns about global diet trends, and demands from countries for systemic solutions that address problems, such as food insecurity, undernutrition, and overnutrition. Below is a visual depicting the Flagship 1 impact pathway. 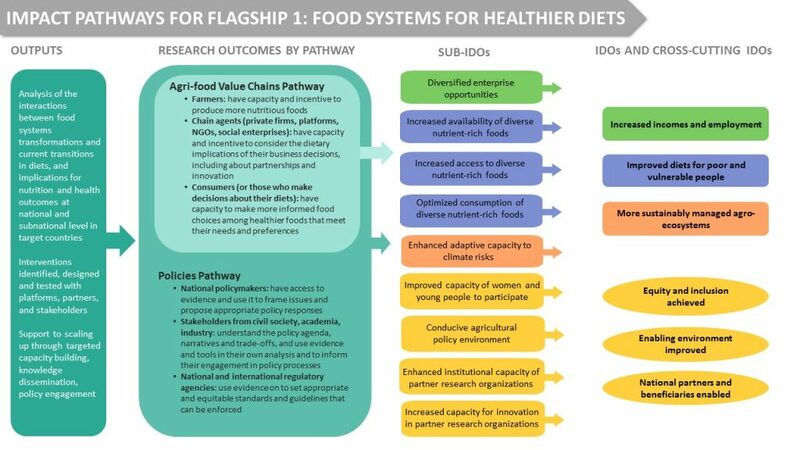 CoA 1: Diagnosis and Foresight assesses regional and sub-regional drivers of food system transformation, and options and constraints for dietary change in order to see partners and other CRPs incorporate nutrition, health and gender in agri-food value chains and food system programs. CoA2: Food System Innovations tests concrete agri-food value chains innovations and interventions for improving diet quality and diversity so that stakeholders – investors, civil society, policymakers – consider healthier diets in processes related to food systems. CoA3: Scaling up and Anchoring supports the scaling up of successful actions through effective engagement of multi-stakeholder platforms and multisectoral mechanisms so that partners can implement A4NH strategies for agri-food value chain and/or food system innovations at scale. 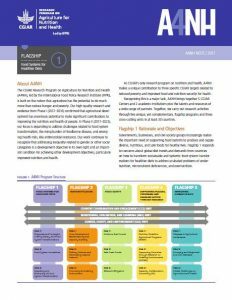 Read more about Flagship 1 and A4NH's work on Food Systems, as well as other news and updates on this topic.